We Go Higher is a documentary co-written and co-directed by Delaney Colaio, who was just shy of three years old when she lost her father and two uncles in the 9/11 terrorist attacks. She was one of over 3,000 children who lost at least one parent that day. The documentary will allow the kids to tell their stories in their own words. Proceeds from the film will benefit Tuesday’s Children, an organization established after 9/11 to help communities impacted by traumatic loss. Donations to cover the costs of making the movie and post-production can be made through the nonprofit International Documentary Association. Local elections are important. If you're a Democrat, get out and vote. To find your polling site, click here. For more information on who is running, check out the CityLimits.org site. Arrive 6:45 for good seats. RSVP recommended. We could all use a laugh. Join Indivisible UES and other activist groups for a social night with a political theme. $20 cover plus 2 drink minimum. Hosted by Bob DiBuono, the exclusive Donald Trump on the Nightly Show on Comedy Central. Congress is scheduled to vote this month on the budget, and the Environmental Protection Agency is on the chopping block. Specific asks for Senator Schumer are that he (1) use all of his authority and influence to block any and all EPA budget cuts and stop any and all riders, and (2) rally the Democrats to be the unified force for the environment they way they were for healthcare. 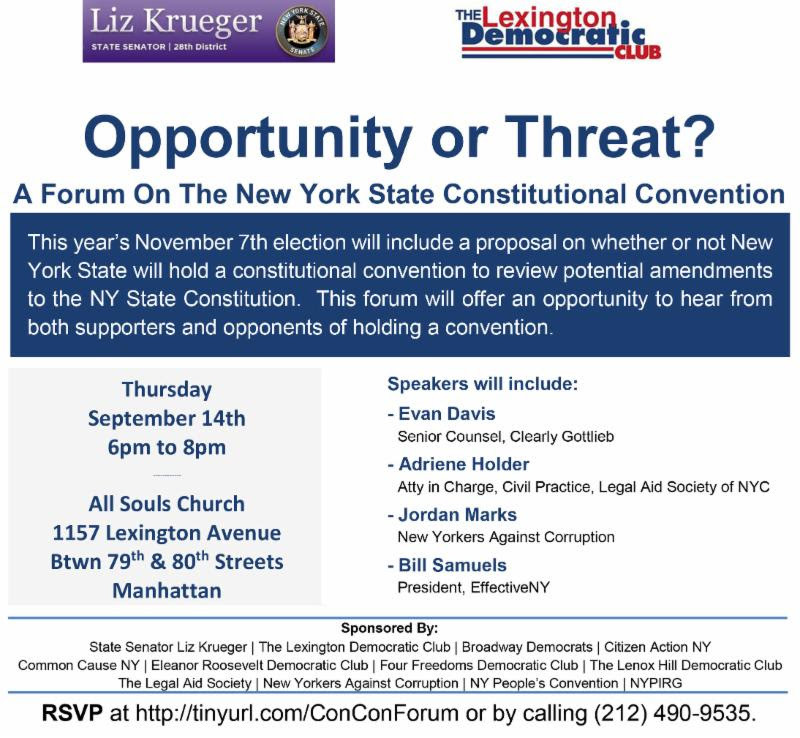 The Nov. 7 election will include a proposal on whether or not New York State should hold a Constitutional Convention to review potential amendments to the State Constitution. This forum will offer an opportunity to hear from both supporters and opponents of the proposal for a convention. Click here to RSVP. 8:15 p.m. - 9:30 p.m.
Join our monthly meeting. We will review recent communications with our senators and discuss other newsworthy topics. Marshals help plan and support direct-action protests. Rise and Resist explains, "We communicate with demonstrators, and we provide a buffer between our group and the NYPD or hecklers. We de-escalate conflicts between protestors, counter-protestors, and the NYPD." If you've wanted to play a more meaningful role in protest activity, this is a good opportunity.